Manolo & Irene is a parodie serie. 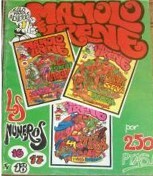 Each book/ issue contains several parodies of different figures. In issue 16 our "Brave Prince" is appearing. The picture below is from a bundle book; it contains issue 16,17 and 18 plus a big poster of all kind of naked comic heroes. Printed in 1982.